2 More Child Chairs can be added for a max seating of eight sardine style or six comfortably as package is offered. 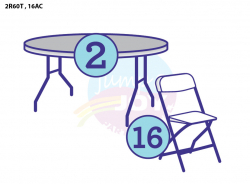 These child chairs match our adult white chairs to complete your event in style. Package for seating up to sixteen, each table seats eight comfortably. Three on each side and one on each end. Fifty-One different dry cleaned & pressed linens and chair covers available as an option in addition to professional setup and takedown. Package for seating up to twenty, each table seats ten comfortably. Four on each side and one on each end. Fifty-One different dry cleaned & pressed linens and chair covers available as an option in addition to professional setup and takedown. Package for seating up to sixteen, each table seats eight comfortably around circumference. Fifty-One different dry cleaned & pressed linens and chair covers available as an option in addition to professional setup and takedown. Package for seating up to twenty-four, each table seats eight comfortably. Three on each side and one on each end. Fifty-One different dry cleaned & pressed linens and chair covers available as an option in addition to professional setup and takedown. Package for seating up to thirty, each table seats ten comfortably. Four on each side and one on each end. Fifty-One different dry cleaned & pressed linens and chair covers available as an option in addition to professional setup and takedown. Package for seating up to twenty-four, each table seats eight comfortably around circumference. Fifty-One different dry cleaned & pressed linens and chair covers available as an option in addition to professional setup and takedown. Package for seating up to forty-eight, each table seats eight comfortably. Three on each side and one on each end. Fifty-One different dry cleaned & pressed linens and chair covers available as an option in addition to professional setup and takedown. Package for seating up to forty-eight, each table seats eight comfortably around circumference. Fifty-One different dry cleaned & pressed linens and chair covers available as an option in addition to professional setup and takedown. Package for seating up to ninety-six, each table seats eight comfortably. Three on each side and one on each end. Fifty-One different dry cleaned & pressed linens and chair covers available as an option in addition to professional setup and takedown. 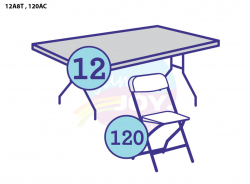 Package for seating up to one hundred-twenty, each table seats ten comfortably. Four on each side and one on each end. Fifty-One different dry cleaned & pressed linens and chair covers available as an option in addition to professional setup and takedown. Package for seating up to ninety-six, each table seats eight comfortably around circumference. Fifty-One different dry cleaned & pressed linens and chair covers available as an option in addition to professional setup and takedown.